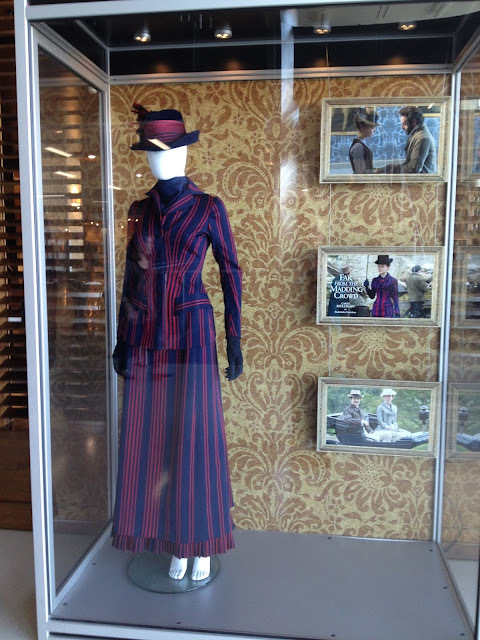 If you're a period film junkie part of the pleasure has to be the clothing. Corsets, petticoats, crinolines, and chemisettes, bustles and hoops. All manner of clothing we modern women eschew. Morning coats and shirtwaists, Tea gowns and walking suits. The number of changes a woman might have to go through in an average day is mind-blowing. IF I'm being really honest, I have to admit that sometimes the clothing is so fetching, I get a wee bit distracted, just for a moment, from the story, so absorbed am I by the cut of a coat, or the drape of a dress, the colors, textures, patterns of the wardrobe. The clothing in Far from the Madding Crowd hit me like that. Because Bathsheba Everdene doesn't live a life full of balls and fancy dress occasions, her wardrobe isn't full of lavish gowns but as a farm owner, a businesswoman, her clothing reflected a strong, spirited sense of self and was designed to project an image of power and a degree of control. That's how many of Janet Patterson's clothing designs for Carey Mulligan as Bathsheba struck me. When Bathsheba is at the farm, working in the fields, her clothes are softer, in weight, in structure and even color. But when she goes into town to sell her grains, she's all business in the dark colors of mens suiting, occasionally brightened with a flash of color. Intrigued by Patterson's process I've tried to dig in and dig up some behind the scenes info but the costume designer for Far From the Madding Crowd is camera shy. I found a video featurette that promises a behind the scenes convo with the designer but instead we have commentary by Assistant Costume Designer Françoise Fourcade! Kudos to Patterson; how refreshing in this me me me day and age, she prefers to stay in the background. 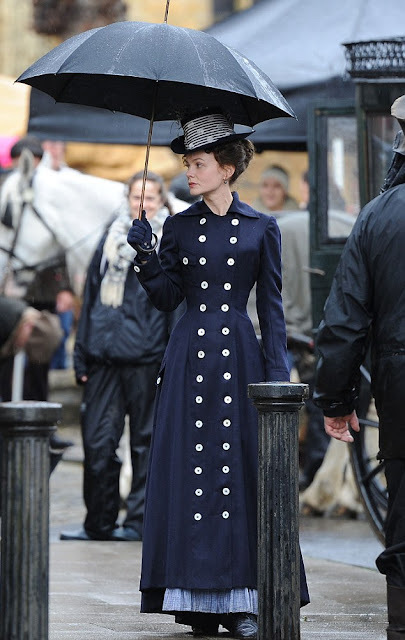 Specializing in 19th century period clothing, Patterson is a four time Oscar nominee (The Piano, Portrait of a Lady, Oscar & Lucinda, Bright Star) who hails from Sydney, Australia. According to imdb 'she is a noted recluse who rarely does interviews or attends awards ceremony's, between jobs she returns to a quiet home life with her family.' Proof, if you needed it, that introverts can be successful in this very extroverted world of ours. "We just didn't want to do another brown, muddy Victorian film." Bathsheba’s costumes reflect the two conflicting sides of her character; that of a practical working woman, responsible for the care and maintenance of a large farm, and of a wilful, attractive young woman searching for her independence. The novel is set in the 1870s, and this was a (relatively small) period in Victorian fashion when dresses were not too big and frilly. Lacking the crinoline and the bustle, the overall silhouette of a 1870s dress was narrow and form-fitting – much more suitable for a woman such as Bathsheba, allowing her to work on her farm without the hassle of dragging a fashionable bustle behind her. ‘Artistic dress’ was the order of the day. Influenced by the Pre-Raphaelite Brotherhood and other artistic reformers, fashions developed medieval details, with informal elements and loose sack-back styles from the eighteenth century. These clothes designs lent themselves well to rural women of means like Bathsheba. Mass production of clothing was not yet in vogue, and women’s clothing certainly could not be bought as we would purchase them today. Gowns, skirts, petticoats, and corsets would have to be made at home or made professionally – but the simpler styles of the 1870s allowed Bathsheba to look as stylish in the country as she would have done in more urban surroundings. Mulligan’s costumes were made to be as authentic as possible, using traditional methods of sewing to recreate Hardy’s idealised England. The gowns are fully complete, with corset and several layers of petticoats underneath, keeping the dress clean and with the added benefit of keeping the wearer warm in an age before central heating and fibreglass loft insulation. Despite their many layers, though, the outfits were designed to be slipped on quickly and easily. The film was shot in just eight weeks, and the performers were often called on to make sudden and speedy costume changes to keep the film’s production schedule on track. Love fashion in film? Grazia Daily has a fun piece on Carey's costumes in Far from the Madding Crowd comparing them to some of this season's fashion looks. What did I think of the movie? And you? Talk to me! **If you're interested in my days as a copywriter at Max Factor I've got a few pieces on my personal writing site that go a little deeper into that time in my life. For what it's worth, here's one and here's another about working with our go-to photographer, and another about working with Jaclyn Smith.